We report the importance of elevated serum lactate dehydrogenase (LDH) and neutrophilia (NT) in two renal transplant recipients who developed renal impairment in the early post-operative period. One of our recipients developed oliguria and increased serum creatinine with unexplained elevation of LDH and NT. The biopsy was C4d positive with platelet and fibrin thrombi in the glomerular capillaries and arterioles and interpreted as acute vasculitis or thrombotic form of antibody-mediated rejection (VAMR) with positive donor-specific antibodies (DSA). Despite intensive treatment, this graft was lost. When another patient developed a similar picture, prompt immunoadsorption was started without waiting for a confirmatory biopsy or DSA, and both were later reported as positive. Improvement in renal function was associated with decreasing levels of LDH and NT. Neither of these was elevated in cases of acute cellular rejection (ACR) or antibody mediated rejection (AMR) with isolated tubular injury (TAMR). It may therefore be reasonable to assume that LDH and NT are potential diagnostic and prognostic markers of VAMR. Antibody-mediated rejection (AMR) is emerging as an important cause of graft failure. Its diagnosis is based on two specific markers: histological evidence of C4d staining of peritubular capillaries (PTC) and circulating donor-specific antibodies (DSA) against donor HLA an tigens in the presence of renal impairment with higher rates of graft loss as compared to acute cellular rejection (ACR). ,, Additionally, a definitive diagnosis of AMR also requires the presence of acute graft dysfunction and morphological evidence of tissue injury. 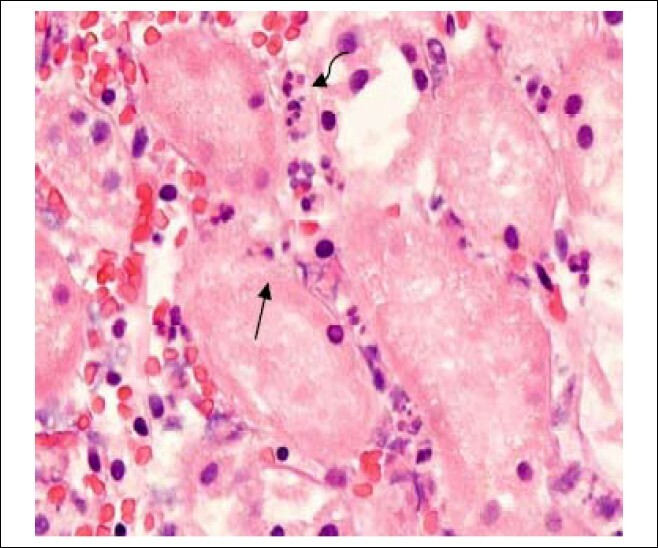 The histological changes in vasculitis or thrombotic form of antibody-mediated rejection (VAMR) include arterial fibrinoid necrosis, cortical infarction, neutrophil margination in PTC, acute monocytic/macrophage glomerulitis and vascular fibrin thrombi. Lactate dehydrogenase (LDH) is an established nonspecific marker of cell injury and necrosis in cardiac, hepatic, muscular and renal tissue, in a variety of infections, lymphomas, hemolysis and delayed graft function. Since embolic native kidney infarction is associated with increase in LDH and neutrophilia (NT), it would be reasonable to expect the same in immunological transplant kidney infarction and necrosis. ,,, A rise in serum creatinine after achieving a stable graft function is multifactorial, and a traditional approach to this event can lead to a delay in diagnosis and treatment. , By the time the results of C4d deposition and the presence of DSA become available, the recipient may become anuric with serious consequences. The purpose of this paper is to highlight the unique importance of elevated LDH and NT in the early diagnosis of acute VAMR and their decreasing levels in response to therapy, which, to the best of our knowledge, is the first such report in the literature. A 52-year-old female, known case of hyper-tension and chronic kidney disease stage V with a zero panel reactive antibody (PRA), electively received a pre-emptive B and T cell cross-match negative, two antigen mismatch live donor kidney from her son. Induction was carried out with Thymoglobulin (1.5 mg/kg) and 500 mg methylprednisolone, and maintained on tacrolimus, mycophenalate mofetil (MMF) and prednisone and her serum creatinine on day six was 73 μmol/L. On day seven the serum creatinine increased to 103 μmol/L, with significant oliguria. Simultaneously, the serum LDH increased to 530 IU from a baseline of 220 and the neutrophil count increased to 7.8 from 3.8. Doppler ultrasound (DUS) showed a patent renal artery and vein but poor cortical perfusion. Methylprednisolone 500 mg was administered empirically along with intravenous fluids, but the serum creatinine further increased to 266 μmol/L, LDH was 1167 and neutrophil count was 16.9 with no evidence of infection [Figure 1]. 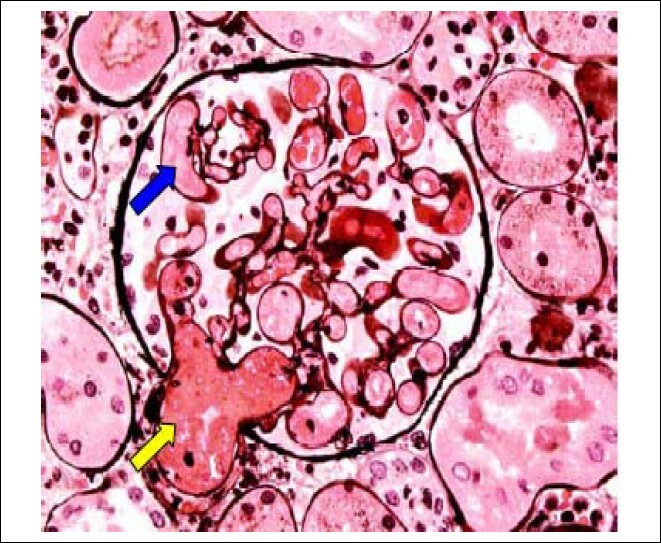 Renal biopsy revealed ischemic changes in the lining epithelium of the tubules along with aggregates of neutrophils in the peritubular capillaries [Figure 2]. The glomerular capillaries showed platelet and fibrin thrombi in the afferent vessels [Figure 3]. The peritubular capillaries showed a positive reaction for C4d deposition [Figure 4]. There was no significant lymphocytic infiltrates and the biopsy was reported as accelerated acute (delayed hyperacute) antibody-mediated rejection (AMR) and DSA were confirmed in serum. Treatment with alternate day plasma exchange and intravenous immunoglobulin was initiated without signs of improvement. The anti CD20 antibody, rituximab, was then added to her treatment, which also failed to reverse the pathology. A repeat doppler showed no changes and no improvement in the renal function; the patient became hemodialysis dependent. A repeat biopsy showed similar changes with areas of focal infarction. Doppler and isotope scans were unchanged and the kidney now measured only 7 cm. At this time, the graft was declared lost and all immunosuppression was discontinued. μmol/L neutrophils ×108/L). Serum creatinine on day 6 was 73, LDH was 274 and neutrophil count was 3.8. Investigations were repeated when indicated. Note the decreasing LDH and NT levels from third week onward, whereas creatinine remained elevated, indicating graft failure. A 28-year-old female on regular hemodialysis for two years for chronic kidney disease stage V received a 34-year-old deceased male donor's left kidney allograft after a negative T and B cell CDC cross-match. Induction was based on thymoglobulin (1.5 mg/kg) and 500 mg methylprednisolone. The cold ischemia time (CIT) was seven hours, the warm ischemia time (WIT) was 33 minutes and the kidney produced urine on the table. Her maintenance immunosuppression comprised of tacrolimus, MMF and steroids, and serum creatinine on day 10 was 55 μmol/L. The following day, the patient became oliguric, the serum creatinine increased to 173 μmol/L, along with a rise in LDH (from 198 to 664) and neutrophil count (from 3.5 × 10 9 to 9.9 × 10 9 ) matching the rise in creatinine. An urgent Doppler showed patent vessels with reduced cortical flow compared to the previous study, and based on elevated markers with acute graft dysfunction, we suspected VAMR and started immediate immunoadsorption. Subsequently, DSA was confirmed in serum and the allograft biopsy was interpreted as accelerated acute (delayed hyperacute) AMR with C4d positivity, neutrophil margination, platelet and fibrin thrombi in the glomeruli and arterioles. Treatment was continued with plasma exchange, intravenous immunoglobulin (IVIG) and rituximab, which resulted in a gradual improvement in urine output and renal parameters, which was notably associated with a decrease in LDH and NT [Figure 5]. The recipient did not require hemodialysis. She made a slow but complete recovery with a serum creatinine level of 75 μmol/L at the time of discharge on day 31 and 85 μmol/L a year later. μmol/L, neutrophils ×108/L). Serum creatinine on day 10 was 55, LDH was 198 and neutrophil count was 3.5. LDH, neutrophil count and creatinine started decreasing in the third week, indicating improvement in renal function. We realize that this is a report of only two patients where we discovered the association in the first and applied the findings in the second recipient and successfully suspected VAMR very early. We believe these markers can have considerable impact on graft outcomes by enabling early diagnosis and treatment. Higher graft failures have been reported when correct treatment is delayed, ,, and Bohmig et al consider early diagnosis of VAMR with timely treatment crucial to achieving better outcomes and speculate that early removal of deleterious antibodies might prevent severe and irreversible injury. We believe that our second patient had a favorable outcome because we treated VAMR very early based entirely on elevated LDH and NT. According to our best knowledge, this is the first such report in the literature and we feel it will make an important contribution to the early diagnosis of VAMR and assist in improving outcomes with early treatment. We have also observed an increase in LDH and neutrophil count in live donor recipients who received kidneys that had minor polar arteries sacrificed at donation. This increase resulted from small areas of necrosis around the ligated artery but did not affect graft function because the necrotic area was small. However, concomitant graft dysfunction would suggest widespread necrosis and it would appear from our cases that the higher the levels of markers, greater the damage. Probably, it has been appreciated for the first time that this microvascular thrombosis could cause clinically significant infarction and increased cell injury markers and correlates with increase in LDH and NT. One can argue that the rejection might have been more severe in the first patient, but both had similar VAMR severity grades. The only recognizable difference appears to be that the second recipient received prompt treatment and this may have helped in arresting the rejection process before irreversible changes set in. During the same period, we encountered nine patients with biopsy proven ACR, two with TAMR but none had a rise in LDH or NT. Importantly, based on our experience in patients with acute renal dysfunction and an increase in LDH and NT, a diagnosis of ACR is very unlikely and empirical steroid therapy can be avoided. At least in theory, these markers may be expected to increase in severe ACR with a vascular component, but we have not observed this type of ACR in our recipients. In conclusion, we describe a unique association between an increase in serum creatinine, serum LDH and NT and the diagnosis of VAMR, and their decrease with improvement in response to therapy in two patients. This combination was not seen in any patient with ACR, HUS or TAMR, the other common causes of early graft dysfunction. This is probably the first such report in the literature and it is hoped that the findings of this preliminary report will be corroborated in larger studies. 1. Truong LD, Barrios R, Adrogue HE, et al. Acute antibody mediated rejection of renal transplant: Pathogenetic and diagnostic considerations. Arch Pathol Lab Med 2007;131(8):1200-8. 2. Mauiyyedi S, Crespo M, Collins AB, et al. Acute humoral rejection in kidney transplantation: II. Morphology, immunopathology and pathological classification. J Am Soc Nephrol 2002;13:779-87. 3. Terasaki PI. Humoral theory of transplantation. Am J Transplant 2003;3(6):665-73. 4. 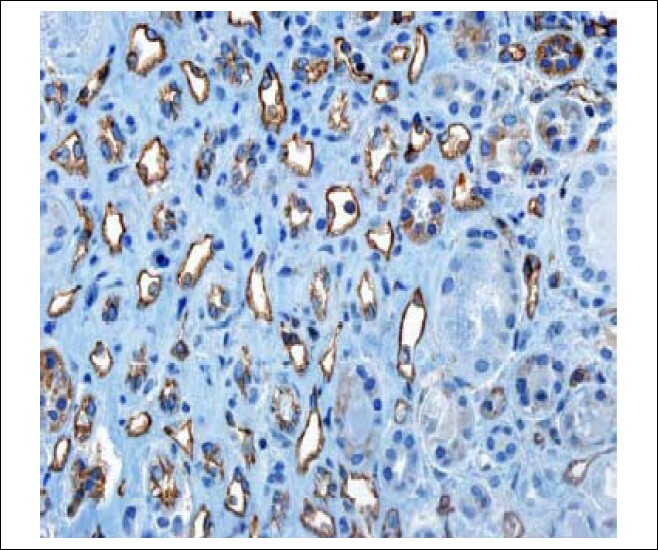 Racusen LC, Haas M. Antibody-mediated rejection in renal allografts: Lessons from pathology. Clin J Am Soc Nephrol 2006;1:415-20. 5. Boothpur R, Brennan DC. Didactic lessons from the serum lactate dehydrogenase post-transplant: A clinical vignette. Am J Transplant 2008;8: 862-5. 6. Hazanov N, Somin M, Attali M, et al. Acute renal embolism. Forty four cases of renal infarction in patients with atrial fibrillation. Medicine (Baltimore) 2004;83:292-9. 7. Korzets Z, Plotkin E, Bernheim J et al. the clinical spectrum of acute renal infarction. Isr Med Assoc J 2002;4:781-4. 8. Halloran PF, Wadgymar A, Ritchie S, et al. The significance of the anti-class I antibody response. Clinical and pathologic features of anti-class I mediated rejection. Transplantation 1990;49:85-91. 9. Takemoto SK, Zeevi A, Feng S et al. National conference to assess antibody-mediated rejection in solid organ transplantation. Am J Transplant 2004;4:1033-41. 10. Bohmig GA, Regele H, Exner M et al. C4d-positive acute humoral renal allograft rejection: Effective treatment with immunoadsorption. J Am Soc Nephrol 2001;12:2482-9. 11. Colvin RB, Smith RN. Antibody-mediated organ-allograft rejection. Nat Rev Immunol 2005;5: 807-17. 12. Burns JM, Cornell LD, Perry DK, et al. Allo-antibody levels and acute humoral rejection early after positive cross-match kidney transplantation. Am J Transplant 2008;8:2684-94. 13. Nickeleit V, Andreoni K. The classification and treatment of antibody-mediated renal allograft injury: Where do we stand? Kidney Int 2007; 71:7-11. Wang, T. and Wang, Y.-Y. and Zhou, R. and Song, C.-P. and Lin, W. and Niu, X.-Y. and Zhang, L. and Hu, H.-Z.